Surrounded by potentially dangerous glacial lakes that can burst and cause floods any time, Sikkim is a ticking time bomb. Worse, Sikkim's disaster management authority and meteorological office are dragging their feet over installing early warning systems for flash floods despite the National Disaster Management guidelines on floods setting 2009 as the deadline. Glacial lakes are formed by melting glaciers and sudden discharge of large volumes of water and debris from them is is termed glacial lake outburst flood or GLOF. The inventory of glacial lakes in Sikkim Himalaya, prepared using temporal satellite data, shows the presence of 320 glacial lakes. Analysis of satellite data has also revealed that a lake has formed at the snout of South Lhonak glacier, that is at a height of about 7,000 metres. The lake, bound only by loose soil and debris called moraine, could cause havoc downstream if it ruptures, according to scientists Babu Govindha Raj and his colleagues at the National Remote Sensing Centre (NRSC) in Hyderabad. A sudden outburst "can create devastating floods downstream," they warn, adding that the probability of this happening "is very high". The glacial lake hazard vulnerability studied in Shako Chhu lake in Sikkim Himalaya shows a high risk of GLOF. Due to increase in the rate of melting of the glaciers, lakes are increasing in the area and so is their stored water capacity. Sikkim falls in Zone-IV of the Indian seismic chart and earthquakes may trigger GLOF. An earthquake of magnitude 4.9 of September 21, 1991 was reported near the parent glacier feeding the South Lhonak Lake and earthquake of magnitude 6.9 approximately 70 km from the lake was recorded on September 18, 2011. A V Kulkarni, expert on Himalayan glaciers and visiting scientist of Indian Institute of Science, says investigations in Indian Himalaya suggest that most of the glaciers are retreating and also losing mass. This consistent shrinkage in mass and extent can affect stream runoff over a long term. In addition, this process can be further influenced if more glacial lakes are formed due to increase in debris cover and if black carbon (soot) is transported in accumulation areas of the glaciers. Therefore, continuous monitoring is needed to understand changing dynamics of Himalayan glaciers. “However, there is lack of ground base investigation of such potentially dangerous lakes,” he says, adding that even though an exhaustive inventory of glacial lakes exists with International Centre for Integrated Mountain Development (ICIMOD), updated information is hard to come by. 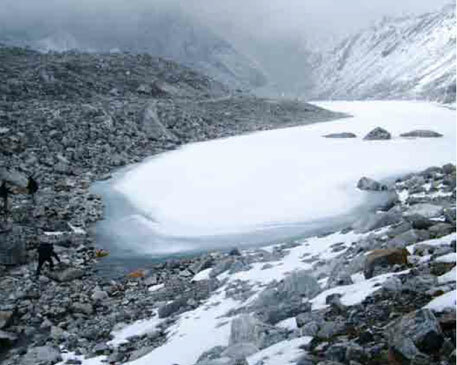 Studies confirm that many glaciers of the Sikkim Himalaya are forming glacial lakes with increasing intensity, which in fact is corroborated with the intermediate effects of long-term climate change by majority of scientists. According to Binay Kumar and T S Murugesh Prabhu of Pune-based Centre for Development of Advanced Computing (C-DAC), monitoring and tracking of the lakes in west and north Sikkim has revealed that quite a few of them are expanding due to accelerated glacial retreat and melting due to climate change impacts. The lakes have been increasing in size and volume since 1965. Their area has increased significantly in about 45 years and this indicates the lakes are important from the disaster point of view and also in view of climatic variations in the past three decades. In addition, new lakes have also developed due to glacier retreat and melting. As they retreat, glaciers leave behind moraines (accumulation of boulders, stones or other debris) in the valley. Field observations give an impression of a past GLOF event in the Sebu Chhu valley in north Sikkim. The wide spread of moraines in the valley might have been carried downstream by the flood waters from the Sebu Chho, which appears to have breached in the past. Local information also supports the occurrence of a flash flood in the Sebu Chhu valley. The National Disaster Management guidelines on floods, published in 2008, had set deadline for establishing flash floods forecasting and warning systems using Doppler radars by India Meteorological Department by September 2009. Gopi Nath Raha, IMD in-charge (Sikkim), says that the state meteorological centre has no such mechanism in place. It is only recently that the Sikkim state government has formally taken a policy decision to establish a Himalayan Institute of Disaster Management and Climate Change in Pakyong in the next two years. The decision was taken in light of the September 18, 2011 earthquake. The state is still struggling to formulate disaster management plans at the state, district and city levels. The main glaciers of Sikkim are Zemu glacier, Rathong glacier and Lhonak glacier. The East Rathong glacier is one of the glaciers affected by climate change. It has retreated significantly since 1965 and a marked shift in its snout position has been observed. A glacial lake is in formation behind the terminal moraines due to blockage of the melt. The Indian Himalayan region is home to over 7,000 glaciers, covering an area of 8,500 km. They play a crucial role in shaping and influencing the environmental conditions in India. Siachen, Gangotri, Zemu, Milam, Bhagirath Kharak and Satopanth are some of the important glaciers located in the Indian Himalayan region. Approximately 968 glaciers drain into the Ganga basin in Uttarakhand and over 4,660 glaciers feed the Indus, Shyok, Jhelum and Chenab river systems. The Ravi, Beas, Chenab and Sutlej river systems are fed by 1,375 glaciers and 611 glaciers drain into the Tista and Brahmaputra basins and contribute between 50 – 70 per cent of the annual discharge. The ICIMOD inventory of glaciers, glacial lakes and identification of potential GLOFs affected by global warming in the mountains of India, Pakistan and China/Tibet Autonomous Region, states that Teesta River basin has 285 glaciers with the glacier area of about 576 sq km. There are 266 glacial lakes and 14 of them are potentially dangerous. Though the area is comparatively very small, but the number of lakes and potential GLOF is very high compared to other study region. In the Indian Himalayan region the first GLOF event was reported when the 1926 flood released by the Shyok glacier, Jammu and Kashmir, destroyed Abudan village and the surrounding land which were at a distance of 400 km from the outburst. Another report by Sangewar et al, shows sudden emptying of some of the moraine-dammed lakes of Shaune Garang glacier, Himachal Pradesh in 1981 and 1988, based on high discharge measured downstream. In the Indian Himalayan region GLOF studies are limited and not well understood, the report by NRSC scientists stated. 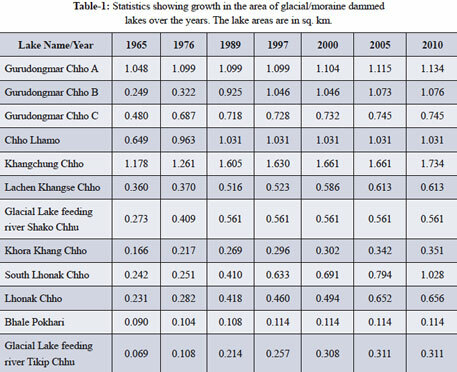 The area of one of the lakes in the Gurudongmar Chho complex has increased nearly four times between 1965 and 1989 (see table). The Khanchung Chho, origin of the River Teesta is another moraine dammed lake which has grown noticeably over past few years. Its area has increased nearly 1.5 times between 1965 and 1989 and approximately one-tenth of its size in 1989 between 1989 and 2010. The Chho Lhamo, a glacial lake that has grown in size significantly is located near the border of Sikkim and Tibet Autonomous Region and feeds the Teesta river. In 1989, its area has increased by 1.5 times its size in 1965. Since then its area has remained almost same till 2010. The increase in area of the Lhonak and South Lhonak glacial lakes over the last 45 years is significant. Both these lakes have grown in area by two times between 1965 and 1989. Lhonak has grown nearly 1.5 times and South Lhonak nearly 2.5 times their initial size in 1989. The increase in size is not the only factor that lists this lake as a potential GLOF source. 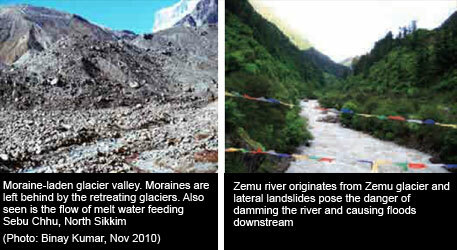 The moraine dammed lake feeding Tikip Chhu in west Sikkim has increased noticeably by nearly five times since 1965. This lake is newly formed due to glacier retreat and is not present in Survey of India topographic sheets. The moraine dammed lake feeding Shako Chhu has increased by nearly two times between 1965 and 1989 and the area remains almost same thereafter till 2010. Another lake in west Sikkim is Green Lake (Tikuchia Pokhari), which is a moraine dammed lake, has formed due to the retreat of glacier near Goecha La. Field observation shows that the lake is surrounded by moraines and there is considerable seepage of water from the southern part of lake. D P Dobhal, senior scientist with Wadia Institute of Himalayan Geology, says that formation of glacial lakes is not always dangerous, though, lakes in the eastern Himalayas are emerging to be risky. Another report by Chandrashekhar V Sangewar of Geological Survey of India shows sudden emptying of some of the moraine-dammed lakes of Shaune Garang glacier, Himachal Pradesh in 1981 and 1988 based on high discharge measured downstream. In the Indian Himalayan region GLOF studies are limited and not well understood. My Ã”Ã‡Â£New Theory on Climate ChangeÃ”Ã‡Ã˜, (Mirza Arshad Ali Beg, http://www.downtoearth.org.in/comment/reply/38648/6190, further elaborated inhttp://www.downtoearth.org.in/comment/reply/38648/6454,and the hypothesis: Ã”Ã‡Â£Dam the Rivers and Damn the Land-Seas and OceansÃ”Ã‡Ã˜ shows with proof that no flow has increased the salinity of the sea all along the coastal zone. The hypersalinity is responsible for lowering the specific heat capacity of seawater from 4.186 to 3.88; the difference though slight suggests that the seawater in the coastal zone will vaporize faster than at the open seas. The high temperatures of the heat zone that is now spread over the arid zone of Balochistan-Sindh-Southern Punjab (that drives the monsoon engine) is considered sufficient to raise the temperature of the Arabian Sea by 1oC to 1.5oC as also reported by the IMO. The ultimate result of anthropogenic activity involved in the irrigation network, rampant deforestation, and desertification is that there will be more vapour over the seas and hence in the troposphere. Since latent heat of evaporation is equal to latent heat of condensation, formation of clouds that is partial condensation of the vapour, there will be exchange of thermal energy and hence warming of the troposphere. Likewise condensation of water vapour over the snow covered mountains will lead to melting of glaciers. Since more water vapour is being made available ever after the damming of rivers i.e. construction dams on the Himalayas, and restraining the rivers to upstream of their delta, thus inducing the delta to run dry; the temperature of the seas has been raised though by only 1.0o to 1.5oC. This has led to availability of excessive water vapour over the seas. Excessive water vapour made available by anthropogenic activities will induce heavy precipitation in the form of excessive rainfall, cloud burst, and snowfall, melting and retreat of glaciers, avalanches, landslides, glacial lake outburst floods ( GLOF s), mudflows and earthquakes.. The thinning and retreat of Himalayan glaciers has already resulted in the formation of new moraine-dammed lakes and the enlargement of existing ones. Small ponds on the surface of lower glacier tongues are also increasing in size and coalescing. The retraction of the glaciers is leading to influx of large quantities of water into glacier lakes. When the water level in the glacial lake rises, it breaches the dam formed of ice, boulders and sand. Glaciers in the eastern Himalayas are retreating faster than in the west and are thus increasing the chances of GLOFs. The resources of the Himalayas were first depleted of the forest cover, followed by snow cover and are now heading straight towards a change in the monsoon pattern and finally towards diminishing of the water resource --- all due to rapid impoverishment of resources. Impoverishment of the primary resources is according to the above environmental scenario, all due to imprudent rapid rate of growth which is not sustainable by traditional yardstick.